"Sloppy joes my Mom made for the Women's Club suppers when I was in grade school. This recipe can be made ahead and reheated, it can also be doubled. Serve on crusty buns and garnish with sliced tomato, lettuce, and dill pickles, if desired." Heat a large skillet over medium-high heat. Add ground beef and onion to skillet and season with garlic powder, salt, and pepper. Cook and stir until beef is completely browned, 5 to 7 minutes; drain and discard grease. Return skillet to stove top. Stir chili sauce, green bell pepper, and tomato sauce into the beef mixture; reduce heat to medium-low and simmer, stirring regularly, until the sauce is thick, about 30 minutes. 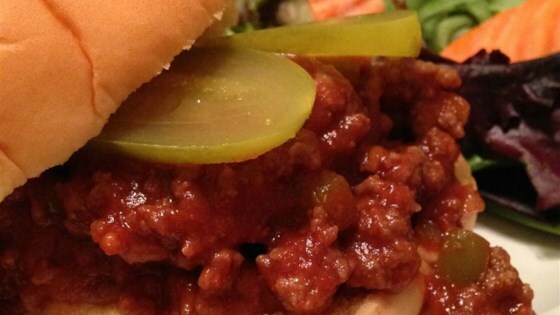 See how to make a super quick-and-easy recipe for sloppy joes. The leaner the ground beef used, the less fat rendered. 2 cups of chili sauce is way too much. We put in half of that and that was still a bit on the hot side. We also substituted fresh garlic for powder. Otherwise, not bad.